Typical symptoms; General pain, inflammation and stiffness that occurs as we age with increasing restriction in movement. 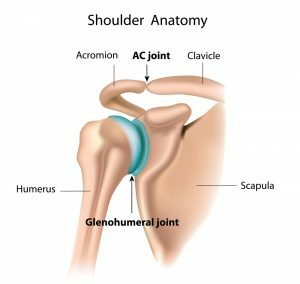 The glenohumeral joint is the main joint in your shoulder. The outer rim of the shoulder blade contains a shallow socket called the glenoid. Here it joins your upper arm bone (the humerus) and forms the glenohumeral joint. This joint can be a focal point for osteoarthritis (OA). OA is one of the main causes of a stiff shoulder (i.e. restricted range of movement). 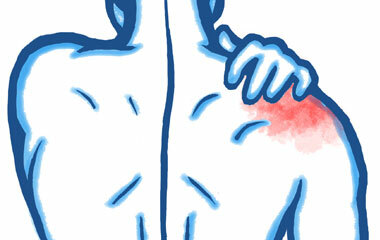 Osteoarthritis (OA) is a common cause of a stiff shoulder (often accompanied by pain). Some people may also experience swelling, tenderness and a grating or crackling sound when moving the affected joints. The severity of osteoarthritis symptoms can vary greatly from person to person, and between different joints. Degeneration eventually leads to abnormal joint function, pain and inflexibility. In normal joints, a firm, rubbery material called cartilage covers the end of each bone. Cartilage provides a smooth, gliding surface for joint motion and acts as a cushion between the bones. As osteoarthritis progresses, the cartilage breaks down, causing pain, swelling and problems moving the joint. This also causes joint space to diminish as the cartilage erodes. Also as OA worsens over time, bones may break down and develop growths called spurs (or osteophytes). The shoulder joints comprise two joints. 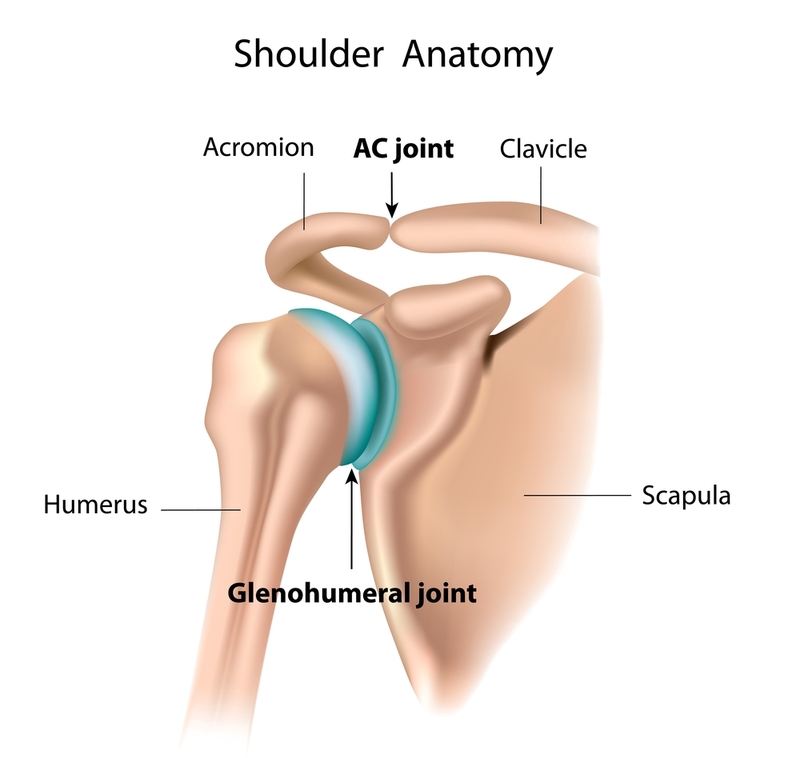 The glenohumeral joint is the main joint in your shoulder as described above. The other joint in the shoulder is the acromioclavicular joint (or A/C Joint). The acromium is a bony hook which curves around the top of your shoulder from the shoulder blade to join your collar bone (or clavicle); hence the term acromioclavicular joint. The acromium and clavicle can be seen below along with the effects of OA. People with A/C joint osteoarthritis have difficulty with cross-body arm movement—holding the arm out straight and then moving it in a horizontal plane across the body, toward the other shoulder. For example, reaching up and across the body to put on your car seat belt can be a challenge. You may also have pain when performing movements such as a press-up, or reaching behind your back, or reaching overhead. Constant overhead lifting performed by plasterers or construction workers, can increase the incidence of A/C osteoarthritis. Other examples are those of us who participate (past and present) in contact sports such as rugby or football. 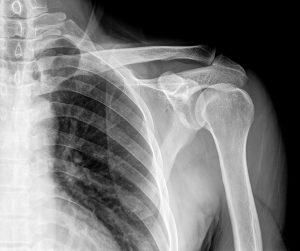 Any blunt force to the shoulder can over time be a precursor for AC joint degeneration. 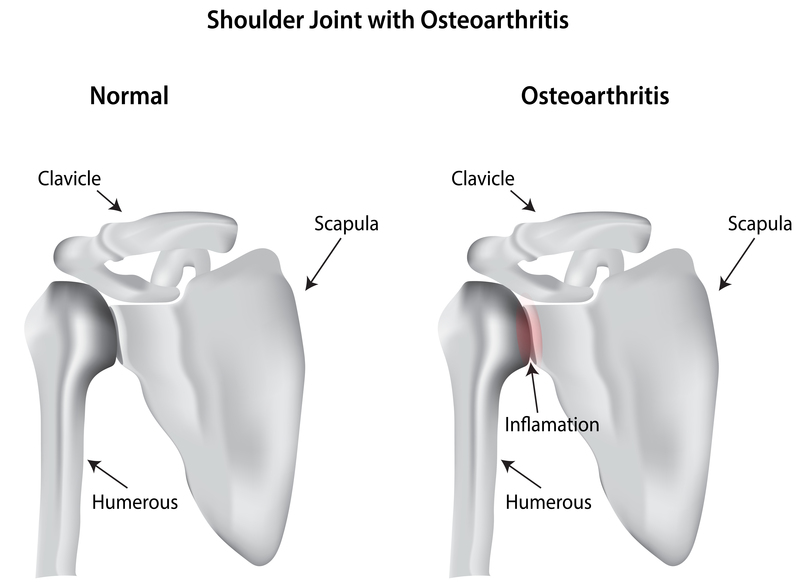 In its early stages, AC joint osteoarthritis usually causes pain and tenderness in the front of the shoulder specifically around the joint. The pain is often worse when the arm is brought across the chest, since this motion compresses the joint. The pain is vague and may spread to include the shoulder, the front of the chest, and the neck. 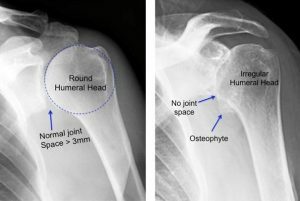 If the joint has been injured in the past, there may be a bigger bump over the joint on the affected shoulder than on the unaffected shoulder. The joint may also click or snap as it moves. 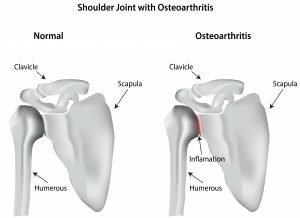 Another consequence of osteoarthritis of the A/C joint is that bony spurs (or osteophytes) can develop and impinge on tendons that are essential for your movement and shoulder stability. These tendons are part of the rotator cuff. This condition is discussed in detail in the section ‘Rotator Cuff Tendinopathy’ in ‘Tendon Problems in the Shoulder’.